Gather—the magazine of the Women of the Evangelical Lutheran Church in America—guides you as you live and experience your faith every day. In addition to a regular Bible study, the magazine offers a mix of faith-in-life articles, theological reflections, devotions and stories that speak to the hearts and souls of progressive Christian women. Gather connects Christian women of all ages with like-minded others who are committed to growing in faith and building the kingdom of God—next door and across the globe. 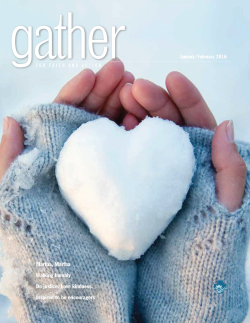 Gather is published 10 times a year with combined issues in January/February and July/August. Digital access is free to print subscribers.